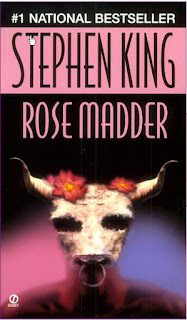 Rose Madder isn't a Stephen King novel that gets talked about much, especially when you consider how much attention some of his work does get. Honestly, until I found this again on my shelf, I had kind of forgotten that it even existed, let alone what the book was actually about. I think the only thing that I sort of remembered was reading that King himself was kind of disappointed with Rose Madder. So I guess I was curious to see how it would pan out. Rose Madder follows Rosie, a woman who decides to leave her physically abusive husband Norman after a 14 year loveless marriage that has already caused her to miscarry once. Armed only with a few hundred dollars that she took from their joint account, she journeys to a new city, where she slowly starts to regain friendship, independence, self-respect and even a little romance. But her newfound happiness may be short-lived, because Norman isn't the type of man who can handle the thought that Rosie not only left him, but took his money in the same move. And even he may pale in comparison to the danger that Rosie lets in herself without even realising. I can definitely see why King refers to Rose Madder as a "stiff, trying-too-hard" novel. 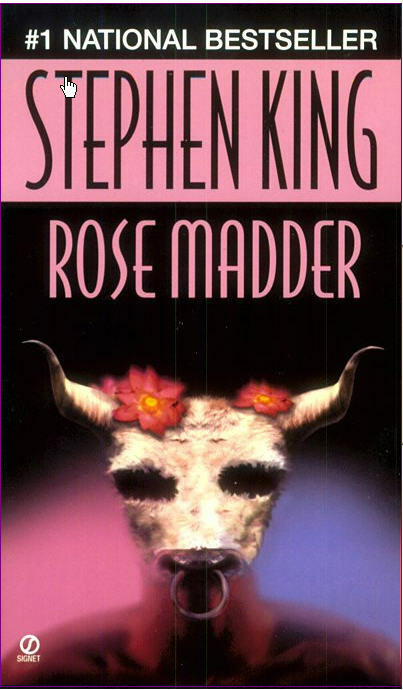 I don't know if this is the best way to describe it, but I would say that there was a real sense that Rose Madder was deliberately constructed, at least in comparison to some of King's other novels. With King, I always got the sense that the bulk of his stories come out in one lump, with some tidying up done after the first draft. You know, making sure that characters act in ways that make sense or highlighting thematic links, that kind of thing. In comparison, Rose Madder felt more like the IKEA version of King: competently constructed, but hardly his best work. Whilst I'm talking about how the novel doesn't work, I should probably mention the supernatural element. So it's a painting that Rosie finds, from which we get the novel's title, and it is somehow the most stiff and awkward part of the narrative, and yet the flimsiest as well. It is when the painting comes to the fore that you really start to notice how obvious the construction is, because it's this clumsy mish-mash of Greek mythology references that really don't mesh well with the modern (at the time of writing anyway) American feel of the novel as a whole. It's all the more noticeable when you're like me and read a LOT of Greek myths as a child, and you get the references. So yeah, while the Ancient Greek angle could have worked quite well, it needed to pick a particular myth and expand on it instead of cherry-picking. As it is, we have a weird mix of Theseus and the Minotaur, the River of Lethe, Persephone in the Underworld, and a blending of the Furies with the Cretan Bull, all of which have very different tones and themes. So that's the stiff part, now for the flimsy. While King's books rarely explain the supernatural elements in great detail, it's usually understandable from a thematic point of view. He had devil surrogates in The Stand and Needful Things representing ways that people can stray from the path if they don't pay attention, and the eldritch monsters from Hearts in Atlantis were a nice metaphor for the loss and fear experienced if we grow up too quickly. Here, there is no theme that the whole painting marries with. Sure, the image of the bull works nicely as a metaphor for her brutish husband, but the rest of the painting could do with a bit more explaining. Maybe the woman in the painting is her, maybe it isn't. It's never really explained and it just makes the climax confusing and conflicting with Rosie's story as an abused woman. Because while I can accept Rosie regaining confidence and beating her husband through wiles, I find the whole "suppressed rage" thing that comes up towards the end to be unsatisfying. It doesn't fit the character arc if she sinks to her husband's level. One thing that I will concede works well is Norman's sections. I have found some reviewers who consider him to be a bit of a one-note villain and I can see why (the corrupt cop who is happy to dish out police brutality is also a domestic abuser, really? ), but the sections that followed him in his search for his errant wife were by far the most vivid and creepy of the novel. There is a line of reasoning in his inner monologue that is utterly awful, but makes him feel so much more immediate as a villain. Honestly, I think that Rose Madder could have been so much stronger if it had done away with the supernatural stuff and just focused on the cat and mouse game between runaway wife and abusive husband. It might not necessarily be the most original novel without the supernatural element, but a more solid and even-toned read perhaps.